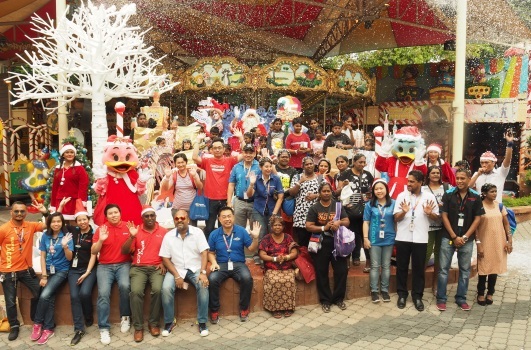 In conjunction with the 25 Wonder Years and the season of giving, Sunway Lagoon will be giving a gift of love to underprivileged families during the festive year-end holidays. In collaboration with Kechara Soup Kitchen, 25 children from 11 underprivileged families were rewarded to fun-filled day of thrilling rides, special meet & greet session with Santa Claus and an educational tour at Sunway Lagoon’s Wildlife Park. The day began with a warm welcome dance performance featuring Sunway Lagoon’s celebrity couple – Captain Quack and Lady Quack. Staying true to bringing smiles, laughter and wonderful memories, especially during this season of giving, the children also receives presents upon meeting Santa Claus during the “Let It Snow – Santa’s Story Time” in the park. After the meet & greet session, the families joined the Wildlife Encounter guided by a Wildlife Ranger at the Wildlife Park. The children were intrigued to learn that the Wildlife Park in Sunway Lagoon houses more than 150 species of animals from around the world. The educational tour then ended with a multi animal show at the Wildlife Theatre before departing for lunch. “We are delighted to be able to fulfill their wish list this season of giving. By hosting them, it gives us extreme satisfaction as we add up to the smiles, laughter and the wonderful memories that they have today. The team at Sunway Lagoon could not feel happier when we see them enjoying themselves in the park,” commented Sean Choo, General Manager of Sunway Lagoon. After their scrumptious lunch, the children enjoyed their time at Nickelodeon Lost Lagoon, Asia’s first Nickelodeon themed land! The children spent the rest of the day wading in the iconic green slime pool during the infamous Slime Time. From 27 November – 31 December, for 5 consecutive weeks, guests can collect 5 different Limited Edition 25 Wonder Years button badges from Monday to Friday upon purchasing 1 Sunway Lagoon Adult ticket (valid for walk-in only). Guests can redeem ONE (1) Adult ticket in January 2018 when they present any THREE (3) badges at the ticketing counter.